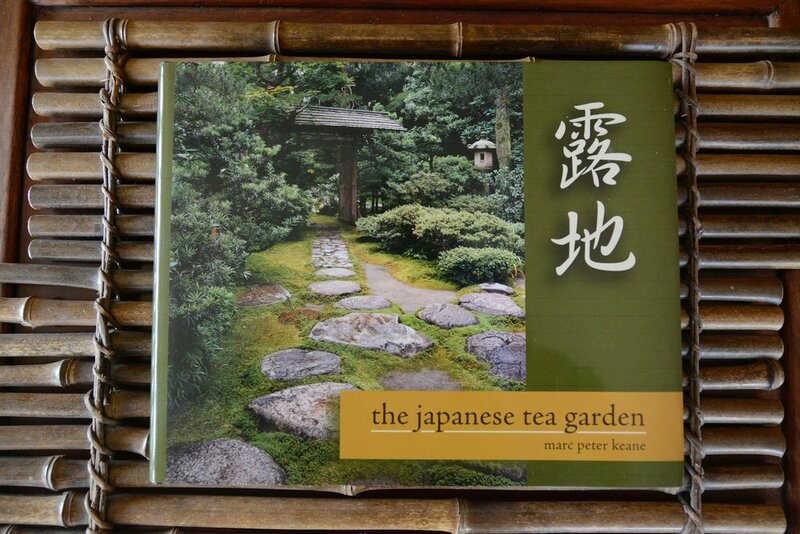 Marc Peter Keane is a scholar of Japanese culture, writer, garden designer, and artist. We first met Marc at a gathering of the International Association of Japanese Gardens in Portland more than 30 years ago. He was a presenter on Japanese garden design. We saw and heard him speak again in San Diego in 2000, where he guided workers in stone setting for a new area of the garden in Balboa Park. He recently presented at the Portland Japanese Garden to promote his newest book, also reviewed in this post. Marc’s writing has been a major source of authentic information for my pursuit of Japanese garden design guidelines. 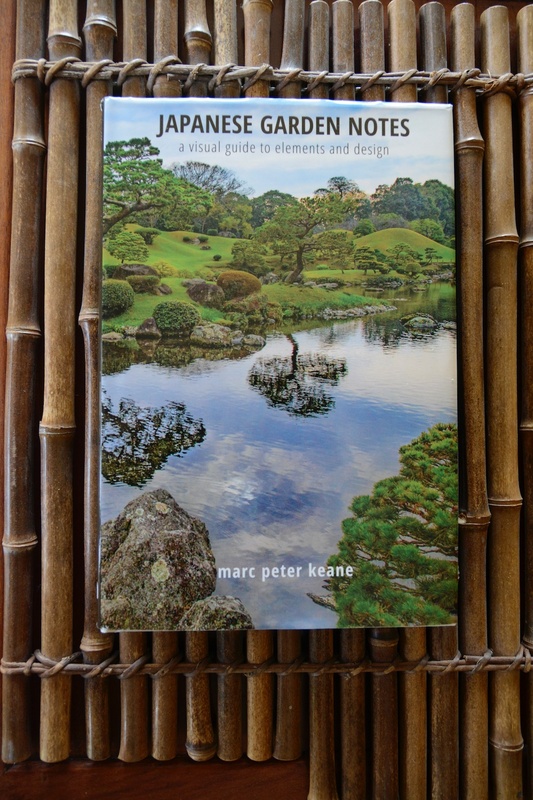 When I’m asked what one book I might recommend for those interested in learning about authentic Japanese garden design I always suggest Marc’s book Japanese Garden Design, 1996. It is clear, organized, and sets the standard for authentic design practices. While researching, before building our tea house, Marc’s book The Japanese Tea Garden, 2009, was instrumental in ensuring we would be building an authentic spaces. Visitors who appreciate authenticity acknowledge the layout and execution of our design. 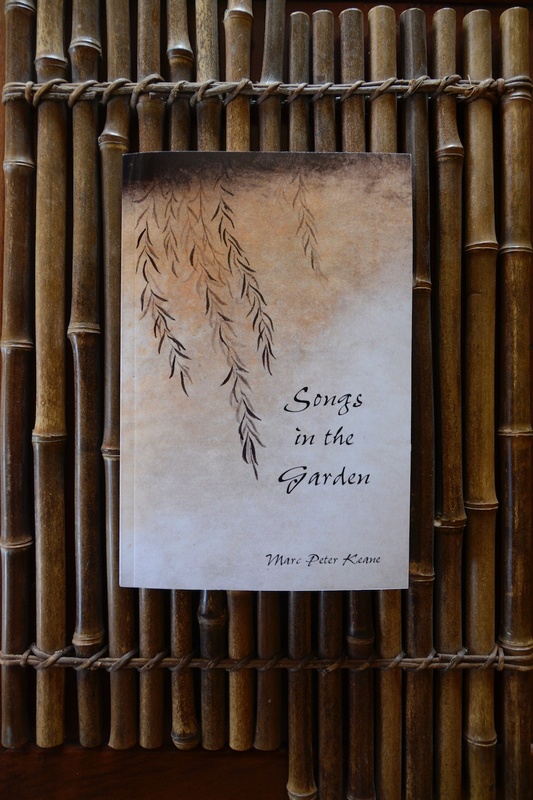 His Songs in the Garden, 2012, is a comprehensive history and analysis of Japanese poetry (particularly the poetic form tonka) and its role as the model of written daily communication in early Japan. The section where he identifies particular words and articulates their double meanings when used in poetry brings new life and meaning to all written poetic gems of Japan. Quite different from the rest of his work is his book of short stories, Moss, 2015, that clearly illustrates his narrative gift. The stories are engaging and always contain a surprise twist or two for the reader (may cause you to gasp!). 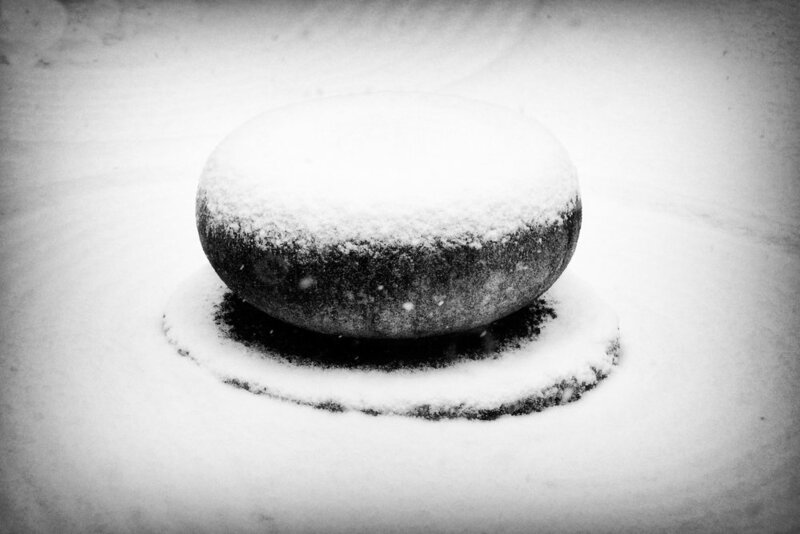 His newest book, Japanese Garden Notes, 2017, is an association of garden images and meaning, where he adds context for what one is seeing. It is a tool to improve your own ability to “see” Japanese gardens for their many layers and historic references. Find these books on Marc Peter Keane's own Amazon page and deepen your Japanese culture knowledge while enjoying some entertaining and meaningful reading this fall and winter! This has been a busy summer in the garden. The annual list of summer tasks was joined by a few special projects that together consumed any time I may have had to write about Momiji-en activities. Now that we’re in the “dog days” I am beginning to reflect on what the summer of 2017 held. We knew before reading the recent news reports that this past summer was an unusual one for the weather (“Hottest August Ever!”). We have recorded more days in the 90’s than ever before from June into September. Thank goodness for a bountiful snow pack last winter as we have poured water on the garden in quantities that have not been accessed before. This summer was also the second in a row dominated by smoky air from wildfires in Oregon and the Northwest. That, along with the high temperatures, has made for a summer spent indoors for refuge. Particularly disappointing was the paucity of appropriate weather to spend more time in the tea house, something we look forward to all winter! Climate change deniers can continue to refute the science but anyone who is paying attention and relating to Nature (especially on a daily basis) knows better. So, is this the new summer norm? I never thought I’d say it, but I truly am looking forward to cleansing rains, cleaner air, and cooler days. Summer just isn’t as much fun as it used to be. IV Hill is prominent in this early 1980's garden view.. When you begin creating a design for a Japanese garden you start first by looking outside the garden for features you want to include or exclude as part of your visual garden presence. What’s included could be a single tree, a group of trees, or an entire mountain or body of water. It's a borroweed hill but is it shakkei? Notice tree growth in this recent image. When the borrowed scenery is dominant it creates the main theme of the garden. If the distant feature only enhances or gives depth to the inner garden setting it is considered simply background. Is it a dominant feature? Would the view be significantly different without it? Shakkei is the Japanese practice of visually borrowing a major landscape feature outside of the garden and capturing it as the main element of the garden. False claims of shakkei are common when this distinction is not recognized and then authenticity is lost. Seasonally hidden from view, is it still significant? When we began designing Momiji-en a nearby tree-covered hill was dominant to the northeast of our garden and became the main reason we purchased the property. We know it as IV Hill. It’s importance to the overall impact of the garden is in framing the garden’s horizon just above and behind the tea house. How about the trees? Are they shakkei now? Over the years neighboring landscape trees between us and the hill have grown to obscure most of its iconic mounding (tamamono) shape. Where we once could claim shakkei at Momiji-en we now must allow it has evolved into just a lovely background for the garden. This is true for about nine months of the year when the trees all have leaves. However, we are fortunate and thrilled when we regain the shakkei in the winter as the trees become bare and the full arch of the hill is revealed once again (and it isn’t foggy or raining hard!). I’m not sure I have ever read about shakkei being a seasonal, weather effected, element but that appears to be the case at Momiji-en. To maintain authenticity and knowing the garden’s history, we recognize the shakkei at Momiji-en only for our own personal reminder. This is such a quiet time in the gardens at Momiji-en. The leaves have fallen, most are corralled and pruning has come to a halt until the days warm up again. About the only action in the garden now is the comings and goings of the many birds we host annually. I always worry about the hummingbirds cause they’re so small and I can imagine they could freeze solid if they held still long enough. I have been so heartened this year by their constant presence in the various camellias throughout the garden. Evidently there is enough sweet nectar in their flowers to keep the little ones in flight. They particularly like the Yuletide variety that has blossoms identical to the red plastic flowers with yellow centers usually seen on the nectar feeders that everyone hangs up on their porches. I’m happy we can aid in their survival by providing a more natural, fresh, and healthy diet! This morning I was fortunate enough to watch a large bird glide over the garden and land on a nearby telephone pole to preen. It was some sort of hawk (probably a “red tail”) but a juvenile one that was missing most of the identifying marks that I’m familiar with. I could imagine without all the leaves on the trees the hawk had a good bird’s eye view of the ground and critters that might be scampering about below. The warm sun also probably felt good. He was followed in the parade by a flock of chickadees flitting about inside the pine tree outside the garden room window. They certainly were busy! From the tiny to the large and back to the tiny with all the usual mid-sized birds arriving in between. The winter garden may be quiet but Nature never sleeps. Seasonal recognition is especially important in Japanese culture. So much so that instead of just the traditional four seasons, they recognize and celebrate 12 different ones. I’ve found that this works for Momiji-en as well. Each season has early, mid-, or late-seasonal character and timing. Autumn is here and we’re just into what I have come to recognize as our second sub-autumn season. When the UK visitors toured Momiji-en early in October, I pointed out to them that they were witnessing the first of the sub-autumn seasons or “pastel autumn.” The trees had their first signs of color change expressed by pale pinks and subtle oranges. We are now in the second sub-autumn season or “most colorful” autumn period, where the majority of maples in the garden are showing their peak autumn colors. This is the timing for the greatest diversity of color from the many maple cultivars and supporting plants in the garden. In a week or so we will enter the third sub-autumn period or “autumn finale” where the final maples waiting to turn will show their colors. Some of these are the most brilliantly colored of all our autumn trees (saving the best to last?). Momiji-en has more than a dozen cultivars of Japanese maples in the garden and each has its own timetable for fall color. First to color and then lose its leaves is Acer palmatum dissectum 'ornatum' (the one we call “Mary Abbott”), followed quickly by the other laceleaf maple cultivars. The last to lose their leaves will be the three Acer palmatum 'shishigashira' or "lion’s mane" maples. They haven’t even begun to change from their summer dark green but should begin soon. Usually by the second week of November, these become the overall most vibrantly colored trees of autumn. Most leaves will have fallen by early December when we then approach the first of the three phases of winter. In relation to our maples, one of the most interesting of garden phenomena that we observe is “first to fall, last to leaf out.” For each cultivar, this is affected by location, temperature, and sunlight. Another observation we’ve made is the maples will lose their leaves and leaf out again in a particular order. This order stays the same year-after-year although it may shift slightly on the calendar due to changing annual weather patterns. I made all of the maple images shown here on one day, October 25, 2016. Enjoy! Chamaecyparis (Hinoki cypress) backgrounded by various maples in the tea garden (roji). Visit the “Seasons” page to see a wider variety and more complete array of plants and trees that add to the colors of autumn at Momiji-en, Autumn 2016. Momiji-en’s much anticipated visit by members of the Japanese Garden Society of the United Kingdom came and went without a hitch. The weather (at the last minute) cooperated with 72 degree warmth and a bright, lightly overcast afternoon. No umbrellas, no heavy clothing, just comfortable attire and leisurely timing to explore. Arriving about noon, the group comprised 21 visitors. Eight of us “locals” were their hosts. All participants engaged immediately with conversations about sukiya living and about our home and garden. Among our guests were doctors, teachers, a nurse, a bricklayer, artists, an architect, public servants, and even a noblewoman, each embracing passion for things Japanese from netsuke and Japanese maples, to sukiya architecture and tea culture. After a warm welcome and distribution of name tags, we began separate group tours: inside to explore Momiji-en interior with its associated garden views, and outside to introduce each of the prototype gardens that make up our kaiyushiki teien stroll garden. After the short tours, we convened under cover of our great pavilion and served lunch at a 24-foot long communal table that was dressed in green linens and adorned with seasonal flowers. While we enjoyed panini sandwiches, salads, chips, seasonal cupcakes, and cold beverages, Momiji-en hosts fielded a variety of sukiya-related questions. Tour members then seized their “free time” to return to favorite garden places to contemplate and make photographs. I prepared Momiji-en sencha tea and, in turn, hosted groups of four or five guests in the tea house. Together, we shared our home grown and processed tea along with unique tea house views and sounds of the Natural Garden. Finally, near 4 p.m., we all returned to the pavilion to say our good-byes. Gwil made group photographs to document the day’s happy participants. As each boarded their tour bus, we presented our departing guests with special Momiji-en “goodie bags” containing Japanese edible treats, a printed resource guide including bibliography, our plant palette, and a glossary. We also included, as a souvenir, a 22-page photo book of Momiji-en that we made especially for the occasion. As our guests boarded the tour bus, seated themselves, and prepared to leave Momiji-en, our eight-person host group quickly lined up facing the side of the bus. We stood at attention, then slowly bowed in unison, a farewell to our honored guests, and slowly rose together again to be rewarded by seeing a bus full of smiling faces and applauding guests standing pressed against the windows. Sayonara, new friends! Our gift to them was humbly given, graciously accepted, and returned in full. Bill Hammerton (L); Ian Wilson (back to camera); Joe Daly (R, making photograph) taking advantage of their free time to explore the strolling paths. I was reminded last night that we are but a microscopic piece of this universe and that by design everything in it functions together for the existence of the whole. As we sat in the garden room viewing the garden, a large horse fly came crashing into the window in front of us. This was the second night in a row that this happened and we wondered if it might be the same fly. It spun around in circles on its back on the deck, got up and limped a bit on five legs, and then stopped and shook itself to regain composer. It was stunned but not hurt. In times gone by I would have taken the opportunity to squash it if I were near enough, after all, they really bite! However, while it sat recovering quietly before us, it gave us an opportunity to observe and contemplate its existence. Surely like most creatures other than humans it was living in the moment. It had no complicated agenda other than to survive, find food, and not be eaten (or squashed!). Its presence or absence was no lesser or greater than our own. It was an equal part of the diverse composition of Nature, and harbored no delusion that it was the center of the universe. Or did it? What a good reminder of our place in it all! Summer is the time we greet a most welcome visitor to Momiji-en – dragonflies. These brightly colored, miniature helicopters are a delight to watch as they perch, feed, and mate in their annual residency at Momiji-en. What we’ve learned over time is we host several dragonfly varieties as well as their smaller cousins, damselflies. Wing behavior at rest distinguishes damselflies from dragonflies. The damselfly folds its wings when perched, whereas the dragonfly maintains its four wings constantly extended. These winged guests range from the largest which are black and yellow or have wings with painted “eyes” on them, through medium-sized “Chinese red” ones (the most prolific! ), to smaller bright blue damselflies. Their lifecycles are full of activity and drama. Once the eggs are deposited in the water of the lake or pond (this is done mid-flight with a “dab” of their tails to the water surface), they will mature into aquatic larvae that eventually emerge from the water in August. Here they perch on a warm stone, where the sun dries and cracks open their exoskeleton and they emerge, unwind their long body and unfold their gossamer wings, transforming them into the flying creatures we so enjoy. One predictable characteristic behavior is they love to perch on rod-like verticals near or in the water. These are often plant twigs but can also be any post or other thin rod. Of course we love these insect guests for their beauty and animation but also we enjoy knowing they are constantly searching for and dining on insects like mosquitoes and gnats. We so appreciate Nature’s pest control as delivered by resident dragonflies and damselflies because we enjoy outdoor evenings on the veranda and in the tea house. A delightful and informative book, Dragonflies and Damselflies of Oregon: A Field Guide, is available from the Oregon State University Press. It was made possible by a gift from former University president John Byrne and his wife Shirley. Although the garden is ever changing—day-by-day, or year-by-year—there are certain annual milestones that, when met, become big “check-off” items on our self-assigned list of duties for fostering the garden. They are milestones such as…When all 43 pines have had their spring pruning care or again when they have their winter pruning care, when the first go-round of tamamono pruning is complete (there are 4-5 shearing cycles each summer), when the larger hedges get pruned (the hornbeams, laurel, and arborvitae), when all leaves have been raked into piles during winter clean-up (and ready to move to where we process them into mulch), when all accumulated mulch has been returned to the garden, and so on. One such milestone just completed is the late spring-early summer “snipping” of all 18 hinoki trees. A partner this year in achieving the hinoki milestone was Mike Fisher, our neighbor and garden intern. As Mike learned, pruning hinoki is a time-consuming task but worth it as the “clouds” in the trees are redefined, drawing attention to their unique eye-catching forms that mimic the “borrowed” Douglas firs! For the gardener, such milestones emphasize the seasonal progression of natural growth processes and the inescapable passing of time. But most important to the gardener as foster caregiver, our labor makes a difference both emotionally and visually. It helps drive motivation of promised personal rewards, therefore giving strength to tackle these chores once again each new year. Access is critical, gardener agility is important! It is said that gardeners live longer because they are always thinking of what’s next for the garden and of the coming year’s projects. The future is now! One thing we’ve learned over the almost 40 years of building our garden at Momiji-en is “this garden is for the birds!” Literally! While we do not offer bird food or feeders, we do provide plant materials birds seem to enjoy. From great blue herons to ruby-throated hummingbirds, they come in all sizes. Plant seeds, nectar, and insects attracted to the garden provide a seasonal array of nourishment for various bird tastes. The biggest draw, however, is the abundance of water, providing an oasis for birds to drink and bathe. From small basins to the creeks and ponds, birds seasonally flock to the garden for hydration. One notable winged visitor and favorite garden residents are crows that have inhabited the neighborhood since before we moved here. Crows are intelligent, inquisitive, and fun to watch. On an almost annual basis, we have observed the crows build nests, protect them from predators and competing crows, and raise one or two chicks each spring. From our observations we have learned that crows are territorial and that the same family may come back year after year with extended family members, usually yearlings from the previous year. They use the garden as a schoolroom for the new chicks. The same lessons are repeated annually. Parent or sibling crows carefully teach the young ones how to dig for worms and grubs in the rich and natural mulch that we spread throughout the garden. Bathing is taught in the creek that feeds the lake. Reluctant at first, the babies soon get the idea that a cool creek can refresh a hot black bird as they submerge their torsos in the passing stream. Our resident bluejays love to torment them while they bathe and create many hilarious pseudo-confrontations year-round! Last winter we observed a “murder” of crows gather to perch in the park trees. It became apparent that they were silently mourning a fellow crow’s death. This was unusual for this group of almost fifty birds, who are usually very vocal. This year is the first in many that we don’t have a nest nearby in the adjoining neighbor’s Douglas fir trees. Early this spring a new avian resident took occupation of an established nest in a pin oak in the park, a pair of red-tailed hawks. Hawks can be a threat to crows and their offspring. After many exciting “dog-fight-style” aerial battles for nesting rights between the two species, the crows relented and are nesting further from the garden this year. We are enjoying them just the same but at a greater distance and less frequently. Isn’t Nature wonderful? Annual plant and animal events become seasonal markers that we gardeners enjoy and cherish. There’s always so much to learn from and about life at Momiji-en. In a Japanese garden, using plants that flower is tricky. One needs to introduce beauty and seasonal “visual treats” for guests but it must not be about the flowers. They should blend in with the landscape as a natural part of the whole. In a chaniwa (tea garden) flowers are considered distractions that take the guest’s mind off the true purpose of the tea ceremony and, therefore, are discouraged. For a strolling garden they can work as seasonal highlights. We don’t have a lot of flowers at Momiji-en, but there is usually something in bloom year-round. Spring and summer are especially suited for blossoms. By early June this year, the rhodis and azaleas have been deadheaded, the Chinese orchids are about done blooming, and the peonies have dismantled themselves. The dominant flowers in bloom now are Japanese iris (a late blooming variety), astilbe, and water lilies. Because they are purposely placed out of the main view, the potted flowers grown in the tea house cutting garden for chabana – displayed in the tokonoma – are saved for the experience of being invited to tea ceremony. The power of these flowers is in their ephemeral character, reminding us of our own short time on Earth and our role in Nature. Any arborist can tell you the several practical reasons we prune trees – the removal of dead or diseased wood, the control of water shoots, the elimination of crossing branches, to manage tree size, and to open up the canopy for air circulation and sunlight. However, few arborists are concerned with the aesthetics of tree pruning. For all of the above reasons, and for some added aesthetic ones that deal with tree form, the traditional Japanese approach also includes keeping trees in scale with the garden and garden guests. This approach allows visitors to feel less overwhelmed – welcomed and belonging in the garden. One pruning technique I use is to manipulate tree scale which produces a sense of depth and distance that doesn’t really exist in the garden and adds perspective which seems to enhance distance. If done successfully, this makes the viewer feel that the garden is much larger than it really is. Recently I was reminded of that when I “butterfly” pruned (generously opened up some maples for light penetration and structural airiness) a group of Japanese laceleaf maples that dot the shizen or natural garden creek and lake. There are five red laceleaf, an Acer Japonicum, and a Butterfly maple in this group of trees that march uphill accompanying each of the waterfalls. The maples had their usual spring abundance of foliage and needed to be pruned to look more mature. When I completed these trees (by removing at least half of the foliage) not only were they more mature looking but they also looked bigger even though they were really a bit smaller than when I started. This in turn made the whole water feature seem much larger both in width and depth. What a nice surprise to be reminded of, one that truly made a big difference in the look and feel of this almost 40-year-old garden! This is the first summer that the tea house has been ready to be occupied. We are having lots of fun discovering how that works. Historically, tea houses have been special places, even sacred in many ways. Our use will broaden that meaning by embracing the space in a more casual atmosphere, but still with all respect and appreciation it is due. When touring the garden recently a young visiting Japanese student exclaimed on seeing the tea house, “It is like the one my Grandmother has!” I asked him if he practiced or knew tea ceremony (chanoyu) and he replied, “No! Too many rules!” and went on to explain that was why many young Japanese don’t participate. Times are changing. Rules must bend or art can’t be created. We will employ the traditional rules as guidelines and adapt those to fit each event. Most of all, we will try to retain the essence of “Tea” – serve as good hosts – and present events tailored to our guests. When the amado (shutter doors) are open and the water garden is in full view, we have observed that the outdoor sukiya most often captures the complete attention of the guests. They become quiet and are drawn to simply gazing out into the garden. We tell guests it is fine to be quiet and we encourage it – to take in the magic. It is the door to a meditative state and brings with it the garden’s power of healing. These quiet moments are as important to “Tea” as the moments when prescribed or more casual verbal exchanges occur. Along with pine trees, this is the time of year to perform a reduction prune on your Japanese maples. A close friend of Momiji-en has for years referred to weeping laceleaf Japanese maples as “Mr. Snuffalufagus,” the large furry creature from Sesame Street, for their shapeless overgrown appearance after leafing out in the spring. Over the years I have found it is necessary to do the majority of this kind of pruning by working from the inside of the tree and from the top down. Watch how the layers “lift” as you remove the weight of some leaves and branches. From here you can most easily identify the downward growing shoots and the overlapping layers of branches. The removal of these is aided by the fact that working this way you can see the remaining branches and leaves nicely back lighted by the sky. Simply work where you see it is the most dense until you have an even overall texture. Avoid the danger of removing leaves and branches from the outside layer where you would be uncovering branches and leaves that have developed under the cover of others. This makes them now vulnerable to sunburn once they’re revealed as the new top layer. Like other tree pruning techniques, the more often you treat the trees in this manner the easier it is to do each spring. Be prepared that it may take years to develop an interior that will even allow you to get inside, let alone stand up under the tree. Prepare the tree by opening it up from the trunk with larger structural cuts in the winter when it is bare, dormant, and the branching armature is easily more visible. The aesthetic rewards of this somewhat tedious work are worth the time and effort. Pruning techniques are specific to the plant material being pruned, making it hard to identify any “universal truths” to draw upon. However, there is one such “truth” that comes to mind when discussing aesthetic pruning for specimen trees. It is this: consider that, first of all, you’re “growing trunk.” Thus, emphasis is on what I consider a “bottom-up” approach to tree design. Trees take many years to mature. These are years of your dedication and your resource investment. In this lengthy development, concerning oneself too early with canopy is a distraction from your main concern of growing a great trunk. Consider these ideas when you prune. Identify the purpose for your tree. - This includes where it will be located (foreground or background), how big you see it getting for the location (scale it to human proportion), and how central is it to the overall garden design (is this a supporting or main feature). Work to clarify that purpose. Design your tree from the bottom up. - When making decisions about what and where to make cuts, start at the ground level and work your way up the tree and out to branch tips. This means initially determining the primary “leaning” of the trunk (is it wind-blown, upright, etc.). Then, season-by-season, year-by-year, look closely at the secondary branches that emerge from the trunk. Over time, you will selectively reduce them, simplifying the structure. Only then will you finally be attentive to the tertiary branches that support the canopy: keep it open and airy. To be clear, these are not one-time pruning cuts. Instead, they are a strategy that you employ, repeat, and modify. These concepts hold true for most evergreen trees (pines as well as broadleaf varieties) and for deciduous trees (such as Japanese maples). Choose which branches to remove by looking for errant ones: misshapen, dead or dying, becoming too large, growing in a contrary direction, or crossing over or crowding other limbs. During the first week of October this autumn we will be hosting a 22-member contingent from the Japanese Garden Society of the United Kingdom (JGSUK) for a day in Corvallis, including touring Momiji-en. 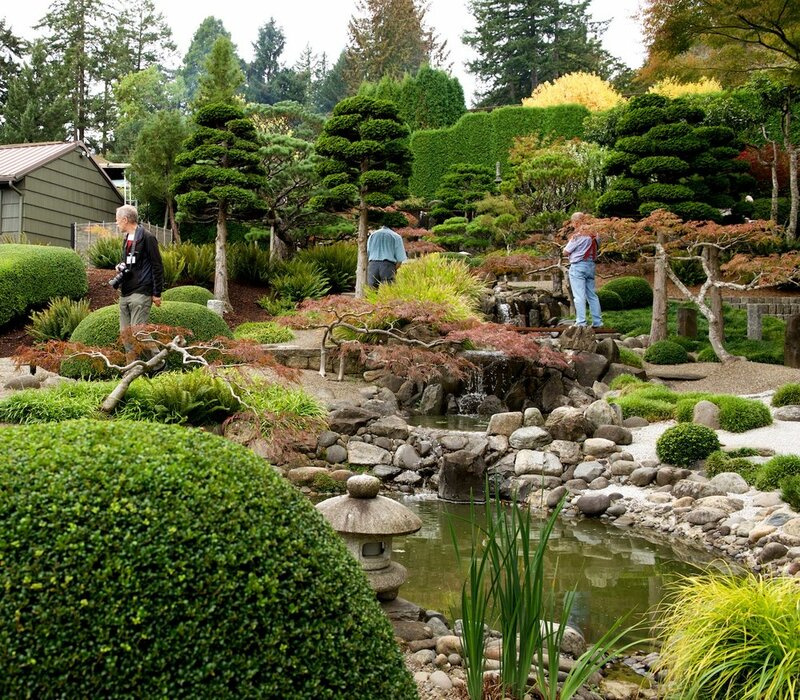 For the first time as a group, our guests are traveling to the West coast of the United States to view gardens from Vancouver, B.C., all the way to Corvallis over an 8-day period. 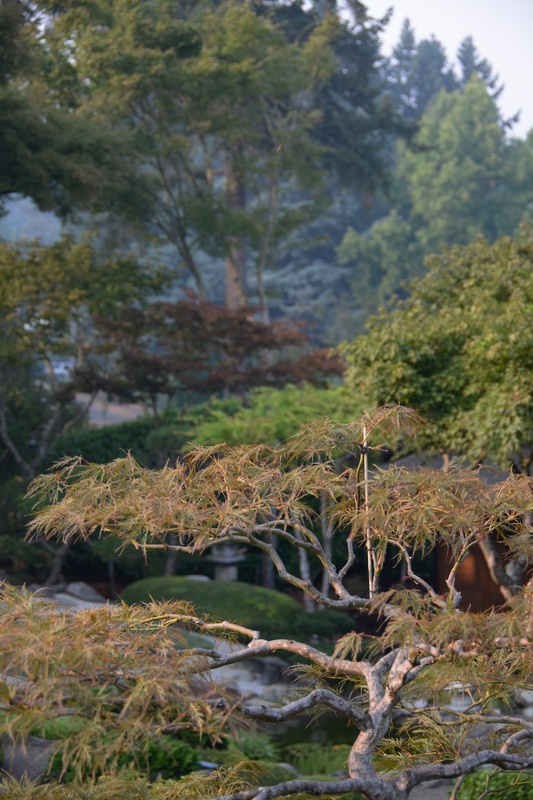 JGSUK members previously have toured the Midwest and East coast, sometimes to attend meetings of the North American Japanese Garden Association (NAJGA). We met their leaders at the 2014 NAJGA conference in Chicago and, there, suggested they come see what the Pacific Northwest has to offer. To help make this happen, we have been encouraging and coordinating travel details with the group’s leaders for some time now. With friends and local Japanese garden enthusiasts Caroline Kerl and Bill Lunch, we’re eagerly looking forward to hosting our United Kingdom friends here in Corvallis. Special event-focused summer projects include: new security fences, irrigation improvements, completing details of the tea house and its surrounds (tea house interior finishes, granite nobedan walkways, a chabana cutting garden), installation of Japanese roof tile edging in several places for ground textural separations, spreading of fresh gravels and mulches throughout the garden, staining and painting various items such as the Shrine and fence posts, building new bamboo fences, and even adding a few new special detail plantings to finish certain areas. Momiji-en will be ready and better than ever when our welcome visitors arrive. This has been a good reminder that it is vital to set goals when you really want to get something done! Years ago while attending a pine pruning seminar at the Portland Japanese Garden, the main presenter, a middle-aged man from Japan, took shears and saw in hand and began to remove large branches on a pine tree, often back to the main trunk. He used a translator to help explain his work during his live demonstration on several large balled and burlapped Japanese black pines. I remember thinking, “How does he know which branches to remove first?” and “What shape will the tree become?” Other group attendees were likewise struck by his expertise, confidence, and insight. There was no hesitation in his moves and he pruned until he was “complete” with that tree. Before our eyes he revealed an elegant beauty and grace from what initially appeared to be an unremarkable pine. As he finished, the group gasped at his boldness closely followed by a communal sigh of pleasure! He amazed us all. I wanted to be able to do that! What I’ve learned over my 40-some years of pine work is that what made that gardener great was his boldness. He knew how far to go, what the tree would tolerate, and that the reward was down the road in years to come. Being bold with the confidence I’ve received from years of practice, I find that each year I get better at reaching that goal. As I get older I realize the time is now. I don’t have the time or energy to do work that isn’t necessary because I’m too timid. The point of aesthetic pruning is to remove all that isn’t necessary which unveils the tree's greatness. So, just get to the point! Pruning pine trees in the Japanese garden style is an art. Like other fine art expressions, the more you practice the better you get. And like other art forms, you must continually critique your work to see if it meets classic standards of excellence. That, too, takes practice. While watching your pines mature, look for classic lines to emerge, a sure sign of developing sophistication. Try to abstract your gaze to be better informed. It is like when I learned to turn a painting upside down while working on it to make decisions about its structure while down-playing its content. That’s harder to do with a pine tree that’s been in the ground for years, but I’ve learned there is a way. 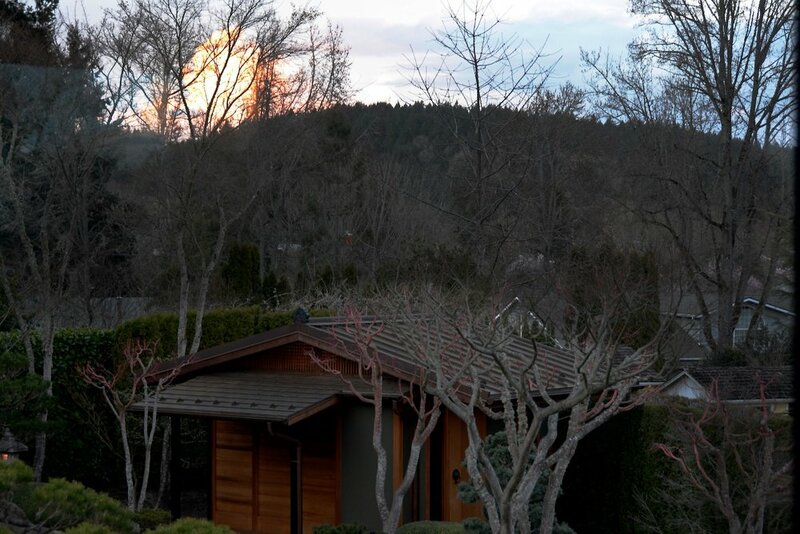 While contemplating the garden recently during “last light” or pre-dusk, an opportunity arose to critically critique one of the black pines on Tsukiyama, The Mountain. The sun was low and shining on the west side of the tree. This, in turn, was throwing a perfect shadow of the tree onto the surface of the tea house cedar amado, or shutter doors. A sumi ink "shadow painting"
There on the side of the tea house Nature had created a classic pine tree outline, a sumi ink "shadow painting." The branch structure and leaf cloud were perfectly “drawn” across the surface of the doors just larger than life. This momentary light-induced abstraction of the tree revealed honest insight into its sophistication. It was lovely! I am reinforced to know I must be fostering this tree appropriately. As beautiful as that pine has become, it’s still not perfect (can it ever be?) but it’s damn close. Watch for these moments. The shadow knew.